The Skinny: 1960's giant flying turtle monster Gamera gets a facelift in this updated re-telling of the monster's battle with the prehistoric bird Gyaos. In 1965 Daiei Studios decided to capitalize on Toho's successful Godzilla film series with their own fire-breathing radioactive star, Gamera the flying turtle. 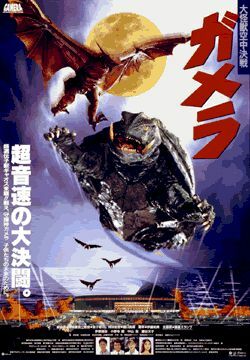 At the time Gamera was "the friend to children" and his films, though entertaining and fun, were largely considered to be inferior to the Toho series of Kaiju Eiga (giant monster films). In 1995, after a 15-year retirement, Daiei brought back the shelled one and gave him a new lease on life. The man given the responsibility of transforming Gamera from a low-budget children's monster into a serious contender fell to director Shusuke Kaneko, whose earlier work consisted of several successful horror films and comedies. director Shinji Higuchi, but his work is seamless with Kaneko's in the finished film. Aside from the bigger budget, the film also succeeds at being more dramatic than the original series. Kaneko treats the characters and plot with respect even when there is humor present. More than any other director in the Kaiju Eiga genre, Shusuke Kaneko succeeds at melding humor and horror.